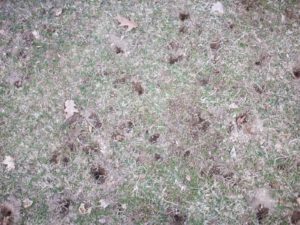 What are the holes that seem to be appearing in everyone’s lawn right now? That’s the $10,000 question! If only I received $10,000 each time I answered this query, I’d be a rich person today. Even if I only got a dollar per call I would make enough to buy a nice lunch every day. January and February seem to be the worst months for this event. Well, it’s nothing exotic, it’s just grubs in the lawn. When the weather gets cold in the fall, grubs dig deep into the ground for winter protection. When we have a few warm days, they will come to the surface, sometimes to feed. 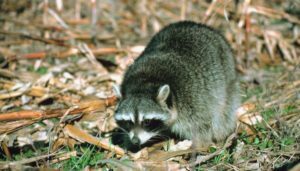 This is when skunks, foxes, raccoons, and even coyotes come into your yard to enjoy a mid-winter snack. What can be done about this free lunch? Right now, nothing! The grubs of Japanese beetles and June beetles are large now with thick, tough skin and insecticides won’t penetrate their skin. These grubs will become June Bugs and Japanese beetles in June and start to lay eggs for next year. During late June and throughout July insecticides may be applied to the lawn to prevent the eggs from hatching in mid-August. Products containing imidacloprid such as Bayer Advanced Season Long Grub Control are very effective when applied at this time. From mid-August until the end of October a different product should be used to kill the newly hatched grubs. This product contains the chemical Dylox and is found in Bayer Advanced 24-Hour Grub Control. These products work in different ways and are only effective when applied during the stated time periods. You won’t normally need to apply both products. One is usually sufficient for good control. Good control of pests relies on the proper insecticides used at the proper time. Tape this article to the refrigerator and refer to it when the time is right. Do the job right and you will be the winner in the grub war. • Do You Have Problems With White Grubs?